LeftCoasts RUSH community cast at a recent weekend rehearsal. The final phase of a 10-year arts vision for the Fylde coast has won a £500,000 Arts Council grant. The money has been awarded to Blackpool’s LeftCoast for its Creative People and Places project by Arts Council England. It will be spent over the next three years. LeftCoast aims to ensure more people from Blackpool and Wyre are inspired by and experience high-quality art and culture. The additional £500,000 takes the total Arts Council England investment in the project to £4.5m. Creative People and Places is designed to ensure more people create and experience great arts and culture in the places where they live. There are 21 Creative People and Places projects across England, based in areas where there are fewer opportunities to get involved with the arts. LeftCoast creative director Tina Redford said: “We’re incredibly pleased that Arts Council England have decided to continue their Creative People and Places investment in our area. 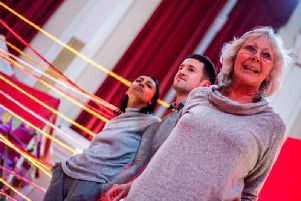 Alison Clark, Arts Council England’s director fro the North, said: “LeftCoast is doing amazing work to bring arts and culture to the heart of the Blackpool and Wyre community.